>> HTMLSource version 2.0! Damn straight! I've worked non-stop, in fear of failing all my exams through lack of doing anything to do with school; but it is done. New, brilliant, layout; new, fast, ad-free server; everything just plain new! I hadn't planned on this redesign, but the layout is just so much better, and allows so much expansion, that I just had to make the switch. So what do you think? Nice, eh? Let me just run through some issues of hatred I had with the old site, and how they are now un-messed. First off, the old server was desperately slow, which made all my optimisation work a bit pointless. So now, the pages will go faster, which is nice. The old layout was quite prone to a few of the more well-known Netscape bugs, so I've made sure this one is ... not. I never had enough space in the old one, what with the three-column design enclosed in only 750 pixels, so in this one two columns are much better and both are wider than before. Better navigation all around the site, with copious links to the full index, homepage and further indexes and such from every page. Trust me, it makes moving around easier. New Advanced Search too. Nicer colour scheme. While working on the Browser Support chart I realised how nice all those colours look together, so now the entire design revolves around them. I backed off on the whole 'completely stylesheet run' idea, because I don't think everyone has a capable browser yet. The code is much improved though, and the better your browser, the better everything looks. Ok, I've gone on long enough. The feeling is good to make a good lookin' site though. Only problem now is getting the masses to read it, and all my search engine listings are for the old address, which is a pain. Oh well, have fun. Haven't updated for a while, but I also haven't stopped working on the site either. This whole redesign, new server setting up, all that jazz, as well as real life to contend with has taken its toll, and I'm bloody knackered. Let's see, what have I done? Hmm... I did an Internet file formats page, loads of editing over the old content to sort it out and add in stuff I've gone over recently on the net and you know... stuff like that. While researching, I did bump into a few things that got me steamed up. These things: Carl Tashian and Joe Barta. I've seen these names all over the place since starting to learn HTML, and now I see them again, on pages with a million hits! So, I decided even if my site is the best of the bunch (and, on the strength of what we have now, I'd be inclined to say it is, but you expected that), I'm not going to become well-known at all. I know it sounds sad and juvenile and everything, but... I just want to be loved, man. So I added by-lines to all the articles, in red text no less. They stand out, yet blend in too, which is nice. Where has all the magic gone?? Where?! Oh well, I guess I've learned that cynicism isn't all fun and games. Had a good Chrimbo thanks, some nice presents and meeting the relations and stuff, which is never less than a barrel of laughs. Hey, it snowed here in Ireland for the first time in ages too, so we took the opportunity to go sleighing in the mountains — bloody great. "Dad, what the hell are you doing bringing that inflatable chair, are you quite mad?" I said. How wrong I was. Kids, if you ever have the chance to belt down a steep slope with a slim cushion of air between your face and the ice, I say do it. I was at Moby last night, an unexpected but welcome present from Santa there, and it was ace. There's me hoping I might see one of my favourite songs and he goes and plays them back to back. Genius. Great lighting too. My God! The Source makes it into another year? Haha, what a joke! Oh well, we're here now, so I may as well be serious. Here is a list of the stuff we have planned for the site in the future. We've already got our new-years redesign, so it's just more stuff that we need now. Also please note, these things have no chance of becoming reality. Well, little or none. Actually, they will. Forget it. Templates — To make learning HTML easier, I'm going to make up a selection of layout templates for people to download, modify and use. The best way to learn is to imitate after all. Hmm... what was that other really good idea I had? Damn. "Oh how all events do conspire against me." Also, » HTMLGoodies, where I learnt HTML in the first place is restarting, which means I'm going to have some competition from one of the big boys. Great. HTMLSource is in to Yahoo! Finally our brilliance is being recognised. The old Source didn't make the cut it seems, but now this one has. Wonderful. Consequently, last night I spent an age submitting to various search engines, so hopefully you'll see the good Source name being mentioned a bit more frequently on the net from now on. Whoa! I'm getting like 30 hits a day from Yahoo alone. Spiffing. And yes, I know that's not a lot, but umm ... excuse excuse .... I'm just starting out! Yeah, that's the one. No doubt they'll start to slow down once I've lost that lovely 'new' graphic and a top-of-page position. Oh well. Whew. After a couple of hours work, we finally have added the first frames lesson to the site. At last, there is a tutorial in every section. It's a really long one too, which is sure to impress somebody. Also, after a heated discussion in a newsgroup, where no one seemed to know what they were talking about, I wrote a thankfully short tutorial on configuring your own 404 error page. More stuff, eh? You can't beat it. I would wish you all a happy Valentine's day, but that would probably make all you HTML-boys even more depressed than you already are, so I shall refrain. Visitors are still coming in from Yahoo, about 15 a day now, but thankfully, some of them are actually returning and adding us to their favorites, which makes it all seem worthwhile. I'm almost finished the lists page, so by the time your read this, it'll be done. Made a couple of slight changes today. The scrollbar has been improved through a new css command I found, and so the CSS and Scrollbars page has been updated too, with a diagram. A white line has been added above the link to » EarthSource, to set it apart from HTMLSource's content. It's a small detail, but it does indeed make a difference. The box at the bottom of this page was added, so anyone who returns to the site and wants to see what's really new can check. It gives this page a bit more relevance to people who aren't me. The search has been improved, and should now return more accurate results hopefully. Tweaking that is a tough job, but I'll be doing some more tests to make it even better soon. Disturbingly, a visitor to the site asked for some pictures of me to be added to the site. "Hmm..." indeed. Anyway, I had always planned to, but my digicam has been off on its travels so I've only gotten round to it now. You wouldn't believe how long it took me to find an angle where I didn't look like a complete idiot. In fact, I don't even know if I pulled it off, and it's all blurry... Ah what the hell — go to the site info page if you can bear it. I was wearing a shirt! Haha. Man, I gotta take a break from this. But no! Not while people are visiting every day, and many are bookmarking us too, which is wonderful. Since 75% of my audience use Internet Explorer, I've added an 'add to favorites' link to every page, so that when you go deep into the site you are still reminded that you think HTMLSource is so great that it's worthy of your return. I moved the full tag reference into its own folder, so I can set it up the way I had always planned; but it just takes so long to add to, what with all the nested tags and linking involved, so even after a good 2 hours work, it's still not finished. Sigh. It's good though. Whoops, I've let the updates slip again. I'm 20 days behind now, and I'll never remember what I've done since last time. Let's see, what's new? Advanced Frames was added, which should keep the frames section going for a while. Umm... I need to fill up some space, so if you don't mind, I'm going on to the next day. ......Hmmm. 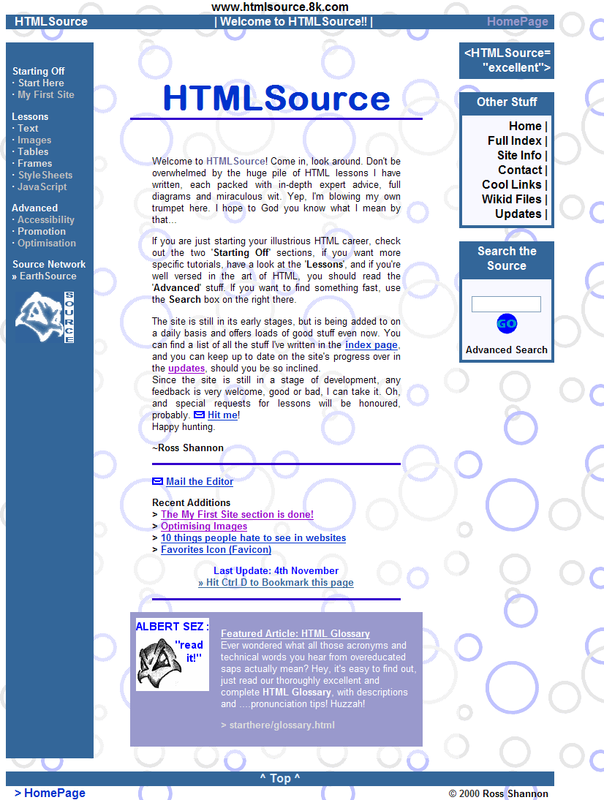 Oh yeah, I made an intro page and engineered it so that if you ever search for 'htmlsource' in a search engine, it will be the first page to come up. This happens when someone visits and doesn't bookmark or remember your URL but remembers the name of your site. I reckon it looks really good, with a curiously resized graphic effect that I like. I finally got my website statistics for February today, and wouldn't you know, it only shows 2 days worth of visits. Bloody hell. What do I have to do to get some service around here, huh? Anyway, things seem to be going to plan on a small scale, but that's still good. Side Note: HTMLSource is now 82 pages fat. Wahey! Happy St. Patrick's Day everyone! You know you wish you were Irish... Well, I'm off for a green pint. Man, I can't wait until summer. I'm going to need about two months of free time to really jump-start HTMLSource's life, but I'm not going to have that for ages... I have more exams coming up next week — important ones. Man, the last exams I had are still on this page — it's like all I ever do. Anyway, sitewise, I didn't do much 'today', but I went submitting important pages to all major search engines. I forgot to mention, we got into the » Open Directory too. Sadly, the editor guy rewrote my excellent description, so I'm going to have to plead with him to change it back. Hurrah, I've caught up on updates. I finally took the brave step to delete htmlsource.8k.com — our old resting place. It was still getting hits from AltaVista, but few were making the jump over to the new layout, so I cut it out. Being the kind gent that I am, I told AltaVista to remove all the references to the old address a week ago, and it still hasn't done it. So people are probably getting a bit miffed at this 'htmlsource place' for not being there when they desperately need my help. Not my fault, lads. Phew, 2 exams down. I added a quasi-useful Internet news thing to the front page, just as a test really. If I feel it benefits you guys, it will become standard. I had a good idea today too: HTMLSource tips. Go to the basic frames page for example, and scroll down a bit to see the useful stuff I have to say. If I come up with enough good stuff, they could be important in the future. A guy told me I look like a druggie in my picture, which was nice. Hey man, just be thankful I don't look like » Jakob Nielson. It's probably better to say nothing, but these exams are going pretty we-- No! I better shut my face or I'll jinx the whole bloody thing. HTMLSource has gone on long enough without the very basics of text formatting, so I wrote a tutorial on changing font face and color. It only took about an hour too, which gave me new hope about writing more stuff, which I've been putting off for ages. Muh. Exams, eh? Whose idea was that? I'm meant to be studying hard for the next week or so, so being the responsible, studious chap that you know I am, I don't have much time to be updating right now. Tonight I might get another lesson written, probably text-resizing and headings. Yeah, that's the one. style="border-top: 1px dashed #99c; padding-top: 0.5em">But wait, there's more: Episode 5.